Even if the species identity is not a concern, the ability to recognize the strain which was introduced into the field is of interest. Appropriate molecular tools have thus recently been introduced for identifying Trichoderma strains in the environment, and to follow their fate after introduction into the soil in situ. To monitor the behavior of a given strain in the soil, Bae and Knudsen (2001) cotransformed T. harzianum with genes encoding green fluorescent protein (GFP), beta-glucuronidase (GUS), and hygromycin B resistance (hygB). One of the resulting strains was formed into calcium alginate pellets and placed onto buried glass slides in a nonsterile soil, and its ability to grow, sporulate, and colonize sclerotia of Sclerotinia sclerotiorum was compared with that of the wild-type strain. The green color of cotransformant hyphae was clearly visible with a UV epifluorescence microscope, while indigenous fungi in the same samples were barely visible. Green-fluorescing conidiophores and conidia were observed within the first 3 days of incubation in soil, and this was followed by the formation of terminal and intercalary chlamydospores and subsequent disintegration of older hyphal segments. In addition, no significant differences were detected in colonization levels between wild-type and cotransformant strains; and the authors concluded that GFP proved a most useful tool for nondestructive monitoring of the hyphal growth of the transformant in a natural soil. 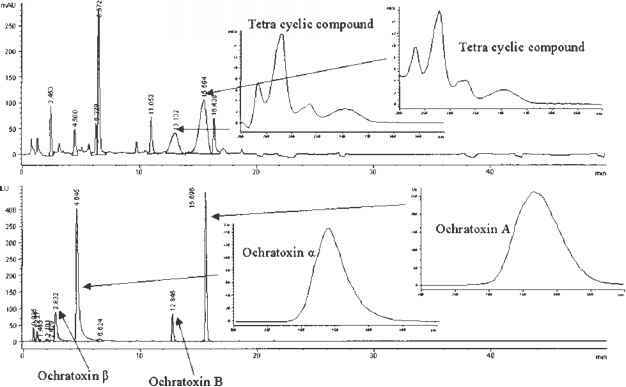 Also, the chromogenic substrate 5-bromo-4-chloro-3-indolyl-beta-D-glucuronic acid (X-Gluc) could be used to monitor the activity of b-glucuronidase in soil. Thus, cotransformation with GFP and GUS can provide a valuable tool for the detection and monitoring of specific strains of T. harzianum released into the soil. As the biological strains of Trichoderma are difficult to distinguish from the indigenous strains of Trichoderma found in the field, Hermosa et al. (2001) developed a method to monitor these strains when applied to natural pathosystems. To this end they used random amplified polymorphic DNA (RAPD) markers to estimate genetic variation among sixteen strains of the species T. asperellum, T. atroviride, T. harzianum, T. inhamatum, and T. longibrachiatum. Analysis of the respective RAPD products generated were used to design specific primers. Diagnostic PCR performed using these primers specifically identified one of their strains (T. atroviride 11), and clearly distinguished this strain from other closely related Tricho-derma isolates, showing that SCAR (sequence-characterised amplified region) markers can be successfully used for identification purposes. An alternative approach, suitable to monitor the presence of several strains in one sample was presented by van Elsas et al. (2000) by selecting a nested PCR approach, in which the first PCR provided the required specificity for fungi, whereas the second (nested) PCR served to produce amplicons separable on denaturing gradient gels. Denaturing gradient gel electrophoresis (DGGE) allowed the resolution of mixtures of PCR products of several different fungi including Trichoderma. Although only limited examples have so far been published, techniques like these and the fast current advance in PCR technology (such as real-time PCR to name only one) will stimulate further studies of the behavior of Trichoderma biocontrol agents in the field is now possible.